Candy is delicious, satisfying, and delightful. Unfortunately, it is also full of sugar and lacking in nutrition. But is all candy bad for you? What are the best low calorie candy choices if you want to improve your diet? And is it possible to eat candy and slim down or at least maintain a healthy weight? Thankfully it is. You just have to know to eat and how much of it to enjoy. Candy calories are empty calories. Empty calorie foods are those that provide little or no nutritional benefit. Often these are foods that are full of solid fats and added sugars (SoFAS). In a perfect world, we'd consume no empty calories at all. We'd only eat foods full of healthy nutrients and vitamins and minerals. But the truth is that empty calorie foods often taste good. So nutrition experts have developed guidelines for the consumption of empty calories. According to the U.S. Food and Drug Administration (USDA) has set standards to help you limit the number of empty calories you consume each day. Each recommendation assumes that empty calories are extra calories consumed after you've reached your recommended intake of other important nutrients and food groups. The limits are based on age and your gender. No candy is really "healthy." The healthiest way to satisfy your sweet tooth is to enjoy fruit, often called "nature's candy." But if you want to indulge in store-bought sweets, there are some products are likely to do the least damage. The Tootsie Pop is one of the smartest choices when choosing a diet-friendly treat. These low-calorie candies, when eaten in moderation, will do the less damage to your waistline. In addition, hard candy calories are usually low. Each of these candies is under 100 calories. A single Tootsie Pop provides 60 calories, 15 grams of carbohydrate and 10 grams of sugar. A single serving (four candies) of Lifesavers hard candies provides 45 calories, zero grams of fat, 11 grams of carbohydrate and 9 grams of sugar. Candy cane calories are low, with an entire cane containing just 45 calories and 12 grams of carbohydrate. One cup of cotton candy provides about 27 calories and 7 grams of carbohydrate. Starburst contains just under 20 calories per fruit chew and only 4 grams of carbohydrate. One factor that makes most of these candies (slightly) healthier is that they take longer to consume. When you spend more time enjoying a single candy, you may be less likely to eat more. Are Mints a Low Calorie Candy? Many brands of breath mints are low in calories. For example, a single tic tac contains under two calories per mint. A single Certs wintergreen mint contains just 20 calories. Mentos provide 10 calories per mint. And Ice Breakers sugar free mints contain just five calories per mint. The only problem with using mints as a low-calorie candy is that we often consume them mindlessly. We usually don't count them as a "treat" or as our dessert for the day. So you may end of consuming several mints throughout the day, which can add up if you're not careful. However, many smart dieters also use mints to curb cravings. So whether or not mints are a smart candy choice for you may depend on how (and how much) you consume them. If you don't like any of the low-calorie candy choices, you can still enjoy candy in moderation. These choices are under 200 calories. However, keep in mind that some of these products are easy to overeat because a single serving is many small, loose candies. Since most of us don't count tiny candies as we eat them, it would be easy to eat too much. One serving of Skittles (about 38 pieces) provides 160 calories and 37 grams of carbohydrate. A single serving of Twizzlers Strawberry Twists provides 160 calories, a half gram of fat, 36 grams of carbohydrate and 19 grams of sugar. A single serving of salt water taffy is five pieces. The full serving provides 150 calories, 2.5 grams of fat, 32 grams of carbohydrate, and zero grams of protein. 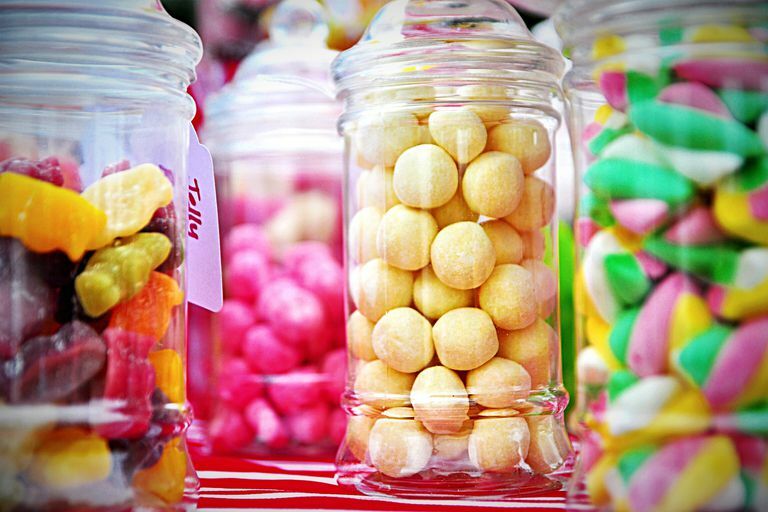 If you find that you are tempted to eat too many of these candies, purchase them only in single-serving containers so you know just how much you are consuming when you indulge. The worst candy for your diet will be anything that is super-sized, "king-sized" or isn't individually wrapped. Why? Because you're most likely to overindulge in these sweet treats. For example, each piece of See's candy in a box of assorted chocolates is likely to provide about 50 calories. That doesn't seem so bad, does it? It's not, as long as you can eat just one piece and then put the box away. But we usually grab two or three pieces (or more) and that's when candy calories become a problem. One Hershey's Milk Chocolate Bar with Almonds (King Size) provides 380 calories, 24 grams of fat, 12 grams of saturated fat, 39 grams of carbohydrate and 36 grams of sugar. One Kit Kat wafer bar provides 218 calories, 11 grams of fat, 27 grams of carbohydrate, 20 grams of sugar and 2.7 grams of protein. One standard-size Snickers bar provides 215 calories, 11 grams of fat, 28 grams of carbohydrate, 20 grams of sugar and 3 grams of protein. One standard-sized Twix bar provides 286 calories, 14 grams of fat, 37 grams of carbohydrate, 28 grams of sugar and almost 3 grams of protein. One standard-sized Milky Way bar provides 264 calories, 10 grams of fat, 41 grams of carbohydrate, 35 grams of sugar and 2.3 grams of protein. The calories in a marshmallow depend on the size that you consume. Those tiny mini-marshmallows provide only 2 calories per treat. Bigger marshmallows contain about 25 calories. Need to cut back on your intake of calories? It's best if you avoid buying it in the first place. The hardest thing about buying and keeping candy at home or at your office is that it is so difficult to eat just one piece. Many people keep a bowl of small candies on their desk or counter and then grab a piece on a regular basis. Those tiny candy calories can add up quickly if you indulge every day, or worse, every few hours. Even though it might make economic sense to buy bulk candy or large bags of chocolate "minis," these tiny treats are too easy to overeat. If you choose to indulge in a piece of candy, buy just one piece of the candy that makes you happy. Then enjoy your single serving and be done. Economy bags of candy might make sense in your budget, but they wreak havoc on your waistline. Candy isn't necessarily bad for you. It provides enjoyment and most would agree that it is one of life's small delights. But too much candy can do damage to your teeth and to your waistline. Enjoy sweet treats in moderation to keep your healthy eating and wellness plan on track. What Are the Nutrition Facts About Hot Dogs? Is There Anything Healthy About a Marshmallow? Should You Be Worried About the Cholesterol in Shrimp? Can Strawberries Be a Healthy Addition to Your Diet?